M. Baebius Q.f. 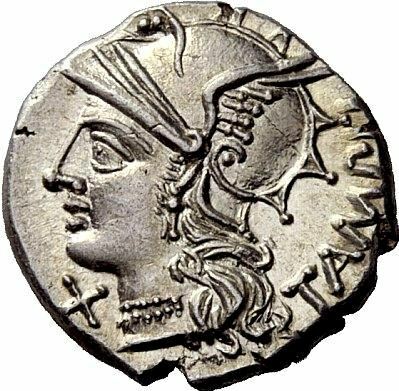 Tampilus was one of the moneyers for the year 137 BC. He is not otherwise known. Gens Baebia was a plebeian family in ancient Rome. The first member of the gens who obtained the consulship was Gnaeus Baebius Tamphilus, in 182 BC. During the later Republic, the Baebii were frequently connected with the patrician family of the Aemilii. The cognomina of the Baebii are Dives, Herennius, Sulca, and Tamphilus. The last is the only surname which appears on coins, where it is written Tampilus. All of the consuls and most of the praetors of this gens during the Republic belonged to this branch of the family.